Who knew. Back in 1958 RCA released along with new Stereo LPs, a reel to reel that was in a cartridge. Very few albums and hard to get players killed off the format, that along with not so hot sound quality and mechanical issues with the player. Still, an interesting footnote before the 8-track and compact cassette came along. 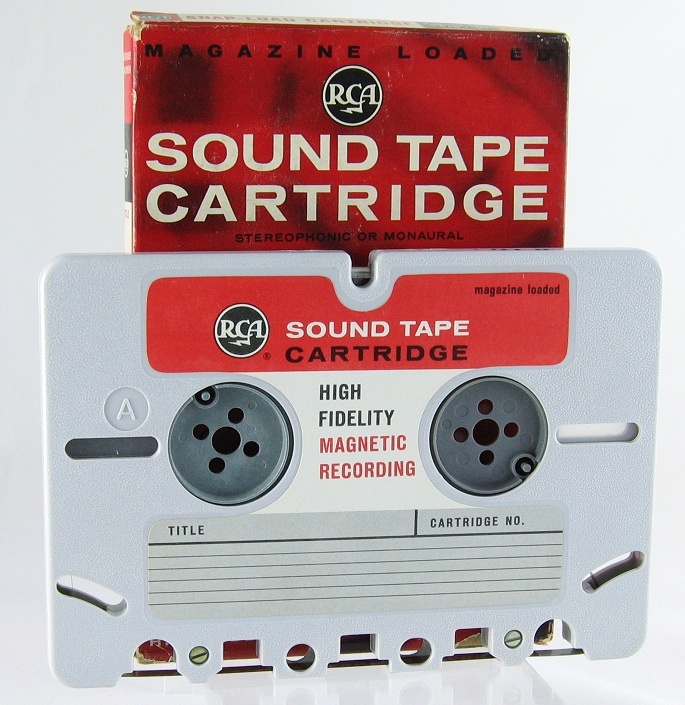 The RCA tape cartridge (also known as the Magazine Loading Cartridge and Sound Tape) is amagnetic tape format that was designed to offer stereo quarter-inch reel-to-reel tape recording quality in a convenient format for the consumer market.It was introduced in 1958, following four years of development. This timing coincided with the launch of the stereophonic phonograph record. The main advantage of the RCA tape cartridge over reel-to-reel machines is convenience. The user is not required to handle unruly tape ends and thread the tape through the machine before use, making the medium of magnetic tape more friendly to casual users. The same design concept would later be used in the more successful Compact Cassette which was invented by Philips in 1962. Because of its convenience, the RCA tape cartridge system did see some success in schools, particularly in student language learning labs. Similar to the Compact Cassette, the RCA cartridges are reversible so that either side can be played. An auto-reverse mechanism in some models allows the tape to run continuously. The tape runs at a standard speed of 3.75 IPS. This is half of the top speed of consumer reel-to-reel tape recorders, which usually offer both 3.75 IPS and 7.5 IPS speeds. Such consumer reel-to-reel machines are capable of superior audio performance, but only at the faster speed. The RCA tape cartridge format offers four discrete audio tracks that provide a typical playtime of 30 minutes of stereo sound per side, or double that for monophonic sound. Some models can also play and record at 1.875 IPS, doubling playing time with a significant reduction in sound quality. This speed is not practical for music, but fully acceptable for voice recording. With two interleaved stereo pairs, the track format and speed of the RCA tape cartridge is fully compatible with the slower 3.75 IPS speed of consumer reel-to-reel stereo tape recorders. It is possible to dismantle the cartridge, spool the tape onto an open reel, and play it on such a machine. Despite its convenience the RCA tape cartridge was not much of a success. A factor in the mostly failure of the system was that RCA was slow to produce machines for the home market. They were also slow to license prerecorded music tapes for home playback. The format disappeared from retail stores by 1964. The physical track width and speed of the tape and even the size of the RCA tape cartridge is similar to, though incompatible with, Sony’s Elcaset system, introduced in 1976. That system also failed to achieve much market acceptance and was soon withdrawn.